Bands should alwayS pull over the tOP OF THe slingshot. This Applies to Both shooting in the over the top & through the forks Style. Never pull straight against the side That the bands are tied onto. These photos highlight the area we consider the “DANGER ZONE”. Like most shooting sports, you should ALWAYS choose a SAFE shooting location, always keep in mind your surroundings and potential bystanders. The New HORNET SLINGSHOT Now Available in our shop!!! How To Aim And Shoot A Slingshot Lesson StartS At Minute "4:50" In the video below. 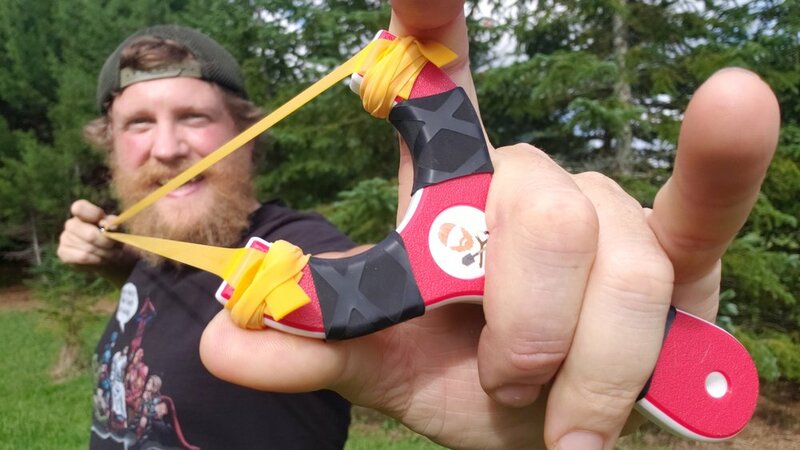 "How To Make a Slingshot In The Wild" Also Covers The Basics Slingshot Shooting. The red line in this photo highlights the “line of sight” from your dominant eye to the desired target. This is a face to face view of how the imaginary red line or your “line of sight” should create a diagonal line from your dominant eye to the aiming point on your slingshots band or tube set. Here we see the importance of maintaining a level (in the diagonal plane) slingshot frame. Turning your frame like this will result in a inaccurate shot. Remember, Its very easy to miss something even as large as a soda can, when you’re aiming at the whole object. Rather than aiming at the whole can, focus on a concentrated area like the letter “e” in the center of the Soda can.